Angostura 7 year Trinidad & Tobago Blended Dark Rum is a popular Rum available from TheDrinkShop in 70cl to buy online. Visit TheDrinkShop for the best price for 70cl of Angostura 7 year Trinidad & Tobago Blended Dark Rum or compare prices on our other Rum products. A blend of light and heavy rums distilled in Angostura's five-column continuous still. The rum is aged in American Oak Bourbon barrels for between seven and ten years. After ageing, the rum is lightly filtered through charcoal to remove impurities, but not so much as to alter the inherently rich flavour or the dark, wood induced. After blending it is returned to the barrel to allow the blend to marry. This silky smooth rum comes into its own after a minute or so in the glass and should be first sampled neat to allow the rum to reveal its true characteristics and provenance. Angostura 7 yr old has a pleasing dark amber hue. It is a powerful, robust and flavoursome rum. On the nose it has subtle flutterings of treacle, chocolate and a gentle smokiness, whilst on the palate it is rich, intense and powerful, with a tantalizing hint of burnt spice. Where to buy Angostura 7 year Trinidad & Tobago Blended Dark Rum ? Angostura 7 year Trinidad & Tobago Blended Dark Rum Supermarkets & Stockists. 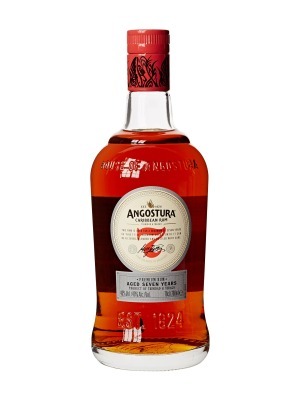 You can buy Angostura 7 year Trinidad & Tobago Blended Dark Rum online in most retailers and find it in the Rum aisle in supermarkets but we found the best deals online for Angostura 7 year Trinidad & Tobago Blended Dark Rum in TheDrinkShop, DrinkSupermarket.com, Amazon.co.uk, and others. Compare the current price of Angostura 7 year Trinidad & Tobago Blended Dark Rum in 70cl size in the table of offers below. Simply click on the button to order Angostura 7 year Trinidad & Tobago Blended Dark Rum online now.